After the security breach at Dropbox, Dropbox comes with the 2-Step Verification method to secure its users Dropbox account. It’s same like Gmail 2 Step Verification which give you more protection to secure your account from hacking. So next time when someone try to access your Dropbox account, at that time he needs a verification code also with the password to access your account. To activate this feature on you have to login your Dropbox acoount and turn on two-step verification. If you don’t have the Dropbox account till, Sign up for a free new Droppbox account here. 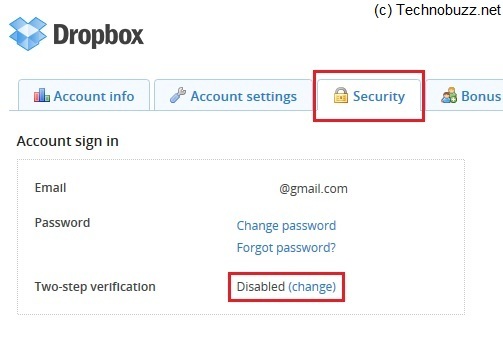 And follow the below step by step guide to protect your Dropbox account. 1. Login to your Dropbox account with your users ID and password. 2. Now Click on the “Name” from the top right corner and click “Setting” from the menu. 3. Select the Security tab from here. Under the Account sign in section, next to Two-step verification, turn the feature on. 4. Once the features is activated on your Dropbox account, it will give your choice to receive your security code by text message or to use a mobile app. 5. Here we selected the text message feature, now you have to enter your Mobile phone number to get the verification code on your Mobile as a text message. 6. Within a few seconds you will received the a 6 digit code as a text message on your mobile phone, now enter that code in the the Dropbox windows to verify your phone number. 7. That’s it, now you will receive verification code on your window. It was a emergency code to disable the 2 step verification from your account. So in case you loos access to your phone or tablet or any other device – this code will be required as an emergency access to your DropBox. Now you Dropbox account is secure and you can enjoy all it features now.